'The King of the Cheap Quickies.' 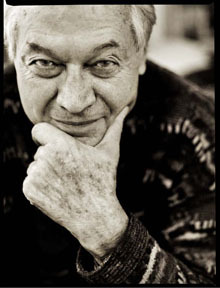 Known for his ability to create well done exploitation and horror films rapidly and on little to no budget, famed writer-producer-director Roger Corman was born in Los Angeles in 1926. He studied briefly at England's Oxford University, then moved on to producing and screenwriting before making his directorial debut in 1955. Joining AIP in the mid '50s, Corman was off and running, helming 1957's Attack of the Crab Monsters, 1959's A Bucket of Blood and the original 1960 classic The Little Shop of Horrors. But it was his color Edgar Allan Poe adaptations in the '60s that seemed to utilize Corman's strengths most efficiently. 1960 to 1964 saw eight Corman Poe pictures, beginning with The Fall of the House of Usher, hitting a midstride with that crow perennial The Raven (1963) - and ending with The Tomb of Ligeia. Certainly 1964's The Masque of the Red Death rates as one of the strongest of the series. His non-Poe efforts from the same period usually fared just as strongly, most notably the well done X: The Man with the X-Ray Eyes (1963) and the same year's The Terror starring a young Jack Nicholson. Although he took a reprieve from directing in 1971 (with the exception of a one time return with 1990's Frankenstein Unbound), Corman settled comfortably into the producer's chair, working for New World. The '70s and early '80s saw Corman producing a wide range of efforts, including 1978's Pirahna and Humanoids from the Deep (1980). He sold New World, established Concorde-New Horizons and continued on through the '80s, putting out fun little gems like Chopping Mall (1986) and 1987's Creepshow 2, among others. The '90s saw Corman continuing to produce, with offerings heavy in the TV arena. While he continues to work, Corman's strongest and most undiluted gift lies perhaps in the output he directed in the 1960s. Wonderful stories, creatively directed, efficiently produced. A very simple formula.